Photo 51 Samoyeds: Rescue vs Breeder: What's Right For You? Rescue vs Breeder: What's Right For You? ﻿﻿ As you can see, I've traveled both roads. Both have their positives and negatives. The key is knowing what's right for YOU. ﻿Before we even get into this, let's get one thing straight right away - the only wrong choice to be made here is the wrong choice for you and your family. NOBODY has any right to criticise you for your choice as long as it is in the best interest of the dog and the household he will become a part of. HOWEVER, this does not mean you can't make a choice you will regret - you most certainly can - which is exactly why it is important to think about all of the following factors BEFORE you purchase a dog, no matter where he comes from. It is also important to recognize that when I talk about buying from a breeder, I am specifically talking about buying from a truly responsible breeder. If you are considering a dog who does not come from a responsible breeder who does appropriate health testing and is breeding for the right reasons, you should be buying a rescue. There is no excuse, and no justification for doing otherwise. Irresponsible breeders and rescues both sell the same product - one encourages the production of more untested dogs and is part of the problem while the other is doing their best to be part of the solution - don't become part of the problem. PLEASE make sure you go check out my page on The Value of a Dog and How to Find a Responsible Breeder so you fully understand WHY this is so important. I feel the best way to hash this out is by discussing each decision making factor separately. Be honest with yourself when reading these, truly think about what you are willing or able to commit to for the next 10-15 years. Yes, we would all love to believe that our dogs are so wonderful and their companionship so precious that money doesn't matter. The reality is that money absolutely DOES matter for most of us. Cost can be a factor in many ways, the initial price tag is only one of them. Generally, it is expected that a puppy from a reputable breeder will carry a higher initial price tag than one from a shelter or rescue due to the higher costs of producing the puppy (health testing, etc), but there are some arrangements where this may not necessarily be the case. It is not unheard of for a breeder to place a dog in an exceptional home for a very low cost (or even at no cost) if the owners are willing to work with the breeder and allow the dog to be used in their breeding program or if they feel the home is ideal for the individual dog. This may mean providing excellent care as well as undertaking the responsibly of keeping the dog intact, so a tremendous amount of trust between the breeder and the owner is necessary. In some cases a shelter or rescue may need to charge an unusually high price for a puppy due to the cost of veterinary care that puppy required, etc. Often, the initial cost of a dog is relatively low compared to the cost of care he will require throughout his life, regardless of where you buy him. Food and daily maintenance care can also be a cost factor. While diet is largely an individual choice, there are some breeds, individuals, or genetic lines of dogs who are more demanding when it comes to diet. When buying from a breeder this can often be discussed and predicted to some degree. When buying a rescue, depending upon the foster/living arrangements of the dog, things such as "sensitive stomach" might also be investigated, but generally only a small window of observation is available (and often this window includes high stress situations). The bottom line is if you're considering a breed or individual dog that is known for or exhibits sensitive skin, sensitive stomachs, or allergies it's a good bet "special" foods are in his future. A breeder may also set requirements for the diet a dog purchased from his/her kennel is to be fed in order to uphold guarantees, etc. It is important to consider these factors as a part of your cost considerations. The purpose awaiting a dog being purchased is a giant variable, and one of the most important. Many people purchase a dog for the sole purpose of companionship. Sometimes buyers have an extremely flexible lifestyle that they are willing and able to customize to the needs of a dog. Often, these people are an excellent match for a rescue if that is what interests them due to their flexibility. Sometimes, while companionship is their goal, buyers also have requirements for traits they are willing or able to work with - they have small children, they require a certain predictable size, they are limited to easy grooming needs, they are unable to work with a particularly crafty or dominant dog, etc. While a rescue may work for many of these people, a predictable set of traits may lead them to prefer a purebred from a responsible breeder or at least an adult rescue of predictable size and temperament. Some buyers purchase a dog for a very specific purpose. Often, these buyers require a dog bred and raised specifically for this task or a very special rescue who can be thoroughly evaluated and often taken for a "trial run" buy the buyer to see if they are a good fit. Another reason it is important to consider purpose is because if a particular purpose requires extensive training, etc, a buyer may not be willing to take a chance on a rescue of unknown genetic health when hundreds of hours of training could be brought to a screeching halt by a disease that may be prevented by a responsible breeder. 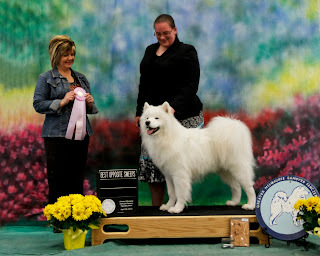 For example, if I want to purchase a Samoyed for use as my sledding lead dog, I just might find a rescue (after extensive looking) who fits the bill, but when I decide to buy a rescue I am taking a risk - I could spend hundreds of hours training the dog only to find out he has a debilitating illness a puppy purchased from a breeder may have been genetically guaranteed not to have. Of course, even when buying from a reputable breeder there are risks - a puppy with 2 "excellent" hip rated parents could be a genetic anomaly and wind up dysplastic - it's just much less likely compared to a puppy of completely unknown background. For most people this may not seem to be much of a factor, but in my opinion, it should be one of the most important ones people take into account. More and more research is coming out showing some major side effects associated with the neutering of immature dogs. Increased risk of osteocarcinomas, torn ligaments due to excessive growth of the long leg bones, aggression, and other temperament problems all seem to be associated with early neutering. This is not to say that neutering should never be done, that is not the case at all, but neutering a dog at a young age (even at 6 months) carries a great many risks. Please check out my page on Joint Health. I simply cannot imagine buying a puppy who was neutered as young as 8 weeks of age, and this is what many shelters and rescues are doing in order to get puppies adopted out. The desire for a young rescue dog puts the buyer in a very tough position when considering the welfare of the dog. While I understand the reason for the rescue/shelter's requirements, I have a very hard time accepting this practice in light of the impact it is likely to have on the well being of the dog him/herself. This is something really important for a buyer to consider. If a puppy is desired, the best choice for the benefit of the dog is likely to be buying from a responsible breeder who agrees to ensuring a dog's growth plates are closed before required neutering (usually between 2-3 years of age). However, adopting an adult dog who was surrendered and not neutered until a few years of age is an excellent choice if a rescue dog is desired. Certainly, the rescue dogs neutered at a young age are in need of homes just as much as the older dogs, and they'll have lots of love to give - it's just important for a buyer to be very clear on the implications of this practice, and take into account the increased cost of things such as ACL surgery that their dog is at higher risk for. There is absolutely no cut and dried right answer here, but a buyer NEEDS to know the implications of the choices they make in this matter. Another issue associated with neutering, particularly in the case of dogs with longer hair, is that neutering will change the length and texture of a dog's coat. Often, in the case of a Samoyed, the coat will grow much longer, softer and more profuse making it a higher risk for matting and harder to maintain. While not as serious as other health implications, it is especially important to remember if grooming requirements are an issue for you. As you may have read on my Joint Health page, exercise and early puppy care appear to have a greater impact on future joint health than we once thought. Some studies have been done showing that better hip health is achieved in puppies who are exercised freely (under their own power and motivation) for greater portions of the day as opposed to puppies who are crated and then encouraged to burn off their excess energy quickly via things such as "dodge and dart" games. When purchasing a rescue dog, it may not be possible to determine how the dog was exercised in the past. Certainly, how the buyer chooses to exercise the dog from that day forward also has some impact. The surface puppies are raised on from a very early age (surfaces with good footing vs slippery floors/concrete) also appear to have an impact on joint health and development. This may be of concern in cases where litters of puppies are reared in places such as shelters where appropriate surfaces may not be supplied. In the case of a breeder or fostered rescue caring for a litter it should be possible to find out what kinds of surfaces a puppy was raised on (and appropriate exercise environments can be provided through puppy hood), but in the case of older rescue dogs this is not something that can be determined or changed. As mentioned in the purpose section, sometimes a buyer has a very specific set of requirements for a dog in their lives, and in this case a rescue puppy may simply be too unpredictable to fit the bill. It is a very poor decision to bring a puppy of unknown final size, weight, build, grooming requirements, temperament, and drive into a situation that is not flexible enough to accommodate them. This also leads to more unpredictable costs as far as food requirements, etc. In a home with a great degree of flexibility and willingness to adjust to whatever the dog ends up to be, this is not a problem, but a buyer needs to truly be honest with themselves about how flexible they are willing to be. An adult rescue is a good option where there is a desire for more concrete and predictable traits. It's also a great option if a buyer has other dogs in their home as a meeting can be set up to determine if the dogs are compatible. In the case where the existing dog in the household is older and may be unable to deal with a rambunctious puppy, an adult rescue with compatible temperament may also be an ideal option. When I decided to take Bailey home with me he was approximately 1 year old and the only dog I would have in my household. He had lots of temperament issues (lack of socialization) but I was willing and able to deal with those issues. He did come to develop joint problems, but again I was willing to accept the risk that came with his unknown background and did what I was able to in order to keep him comfortable and pain free later in life. Bailey was neutered at 6 months of age, and did have the trademark long legs of a neutered dog, but we were very fortunate in that he never did require knee surgery despite his propensity to run like a bat out of heck. As is typical of dogs neutered young, he was also very attractive to intact males, which did cause some problems with him becoming defensive and occasionally preemptively aggressive as he got older and feared other dogs hurting him with overzealous playing or attempts to hump him. A great many foster and "in training" dogs came through my home when Bailey was younger. He got along famously with all but one of them, and he was an exceptional "puppy raiser" as he had lots of tolerance for puppy antics as well as a good understanding of how to appropriately discipline a puppy when they got too rambunctious. I purchased Lilly from a rescue when Bailey was approximately 11 years old and less able to handle a young rambunctious puppy. I spend upwards of 6 months looking for the perfect dog to add to my household as I had very specific requirements - female, smaller in size than Bailey, willing to submit to his "king of the house" status, willing to interact with Bailey without getting too rough, and of a temperament I was able to "live with" (not too high strung, not too clingy, and relatively easy going). Lilly, a young adult rescue, was positively perfect for us in every way. I lucked out in that Lilly was fairly mature when she was spayed so I have fewer concerns about the health implications that a spay carries (although her constant shedding does get a little old). Lilly is an exceptional example of how an adult rescue can fill a very specific hole as long as a buyer is willing to take the time required to find the perfect dog. Lilly is an exceptional little obedience dog, but I hesitate to do any serious agility work with her due to her structure that would not handle it well. (because Lilly was not purchased with the purpose of agility dog, this is not a problem for me) Given the huge fan club Lilly has developed spanning from coast to coast, I would say the time I spent searching for her was well worth it. I purchased Mendel from a group of exceptional breeders. Because Lilly (then aproximately 5 years old) was young enough to handle and enjoy playing with a puppy (keeping him out of 13 year old Bailey's hair) I was able to purchase a puppy with relatively little concern. I desired a responsibly bred dog I could show as well as a structurally exceptional dog to work in sledding/carting, weight pull, and agility. I was able to shape Mendel's drives for pulling at an early age and ensure that he got the appropriate exercise I felt was important for his development. Most importantly, for me, Mendel's parents are both health tested and have exceptional temperaments, a trait I am delighted to say was passed to him.